Mitchell has received eight Grammy Awards, including a lifetime achievement award in 2002. She was inducted into the Rock and Roll Hall of Fame in 1997. 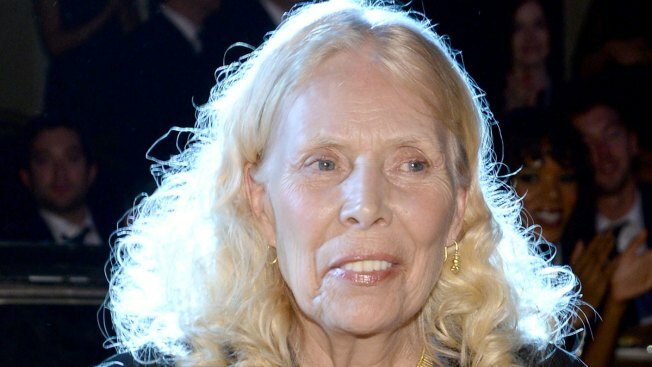 Conflicting information about Joni Mitchell's health was released Tuesday, with a longtime friend stating in a court filing that the singer was unconscious and unable to care for herself while a statement from the Grammy winner's website stated she is alert and expected to make a full recovery. Mitchell has been hospitalized since March 31 for undisclosed reasons. Her longtime friend Leslie Morris filed a petition to become Mitchell's guardian on Tuesday, stating that the singer-songwriter was unable to care for herself. Within hours, Mitchell's official website stated that "She comprehends, she's alert and she has her full senses. A full recovery is expected." Morris' court filing was accompanied by a doctor's declaration stating that Mitchell would be unable to attend a court hearing for four to six months, but it included no additional details on her condition or prognosis. Dr. Paul Vespa checked a box signed on Saturday indicating that Mitchell was unable to participate in her medical care. Jimmy Fallon gives "Nurse Jackie’s" Edie Falco a chance to reattempt her Mets first-pitch throw for "The Tonight Show." "At this time (Mitchell) remains unconscious and unable to make any responses, and is therefore unable to provide for any of her personal needs," states Morris' filing, which was signed by her on Sunday and by her attorney on Monday. Morris sought a court order because Mitchell does not have any family who can serve as her conservator and assist with her care and medical decisions. Her filing does not seek any control over Mitchell's finances. Mitchell's website states Morris' filing seeks to get authority to make decisions for the singer once she leaves the hospital and is isn't under the 24 hour care of a doctor. A court hearing on the filing is scheduled for July 8. Phone messages for Morris and her attorney, Alan Watenmaker, were not immediately returned. She started her career as a street musician in her native Canada before moving to Southern California, where she became part of the flourishing folk scene in the late 1960s. Her second album, "Clouds," was a breakthrough with such songs as "Both Sides Now" and "Chelsea Morning," winning Mitchell the Grammy for best folk performance. Her 1970 album, "Ladies of the Canyon," featured the hit single "Big Yellow Taxi" and the era-defining "Woodstock." The following year, she released "Blue," which ranks 30th on Rolling Stone magazine's list of the "500 Greatest Albums of All Time." Her musical style integrates folk and jazz elements, and she counts jazz giants Charles Mingus and Pat Metheny among her past collaborators.